We are proud of our firm’s achievements to date and aim to become the most valuable global consultancy of European origin and with German heritage. Our firm’s history and our ambition entail a great responsibility. In our profession, success and value creation depend on trust. In a complex and challenging business environment, trustful relations are based on competent, integer and reliable personalities. Respecting laws, regulations and company policies is a matter of course for each and every one of us. Our corporate values of entrepreneurship, excellence and empathy have an impact on the way we work and express our understanding to strive for the highest professional standards. They form a solid ground for our self-conception – as a company, as Partners and employees of Roland Berger. They help us achieve outstanding results and create real value for our firm, our clients and the society we live in. 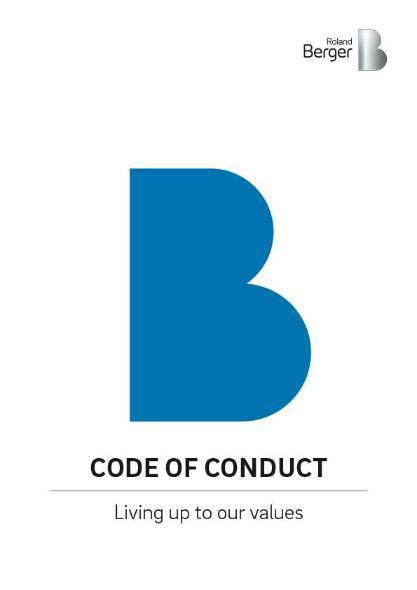 In order to provide clear guidelines for our work and the way we interact with clients, business partners, communities and colleagues, we have developed this Code of Conduct. The Code reflects our value statement and describes how we put it into practice. Today more than ever, ethical behavior, moral action and integrity are the prerequisites for successful business development and outstanding services for our clients.